CLOSE CALL: Graham Smith was the men's runner-up. 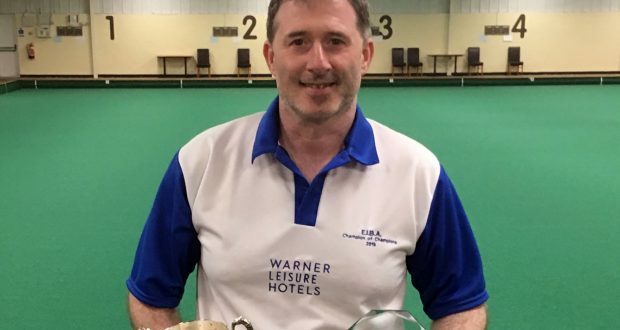 Spalding Indoor Bowls Club’s singles champions Graham Smith and Ruby Hill both impressed in the national Champion of Champions finals over the weekend. Held at Lakeside Coastal Village – part of Warner Leisure Hotels in Hayling Island – Smith was beaten in the men’s final, while Hill reached the last 16. Spalding skipper Smith enjoyed an excellent run in the men’s event. In the last 32 he came up against Dominic McVittie (Blackpool), where he won 21-15 to set up a last 16 clash with former national Champion of Champions winner, Ryan Atkins (Malvern Hills). Smith started that one exceptionally well and won superbly 21-14. The SIBC star continued his good form in the quarter final and semi-final as he beat Kevin Smith from Atherley and junior international, Glen Adams (Herga) in convincing fashion, 21-9 and 21-8 respectively. In the final, Smith faced Dorset’s Martin Puckett – who had already knocked out three senior internationals, so was clearly in good form himself. Puckett started the stronger as he raced into a 14-8 and 17-12 lead, but Smith bounced back well to bring the score level at 17-17. With the game in the balance, the momentum was seemingly in Smith’s favour. On the next end, the Spalding ace laid two shots before an element of fortune helped Puckett to claim a single and go 18-17 ahead. This clearly swung the match as the Dorset player closed out the match with a 21-17 win and the title of national Champion of Champions for the first time. In the ladies’ event, Hill was part of an exceptionally tough section of the draw and in the last 32, faced off against fellow senior international, Danielle Martinson (Hornsea). In a game which was always destined to go all the way, Hill sneaked over the line 21-20. In the last 16, she faced another tough test in the shape of international Wendy King, from Swale. Unfortunately, King proved too strong on this occasion as Hill bowed out 21-16. The Swale star eventually went on to lose in the semi-final to current national singles champion Janice Gower, from Blackpool. Spalding IBC’s sixth over-60s game of the season was an away fixture against top-of-the-table Lincoln A on Thursday – and they suffered a heavy loss. The fixture was always going to be difficult for Spalding to score points in, considering Lincoln have already scored 97 points out of a possible 108 in six games so far this season. Spalding started slowly and after only five ends, were 46-7 down. By ten ends, they had managed to pull back to 70-34 down and were actually winning on one rink, albeit by a single shot. By end 15, the ratio of shots was still going at a similar rate and Spalding were 100-53 down but still winning on one rink, now fairly comfortably – but the other four rinks were definitely under the hammer. By the 21st end, the score was still rising and the home team motored away to a 134-69 (16-2 points) win. All was not lost as Spalding did manage to salvage two points from the winning rink of Tony Westland, Ian McCallum, Ken Challens and skip, Graham Wright (26-15). The captain for the day was Graham Hicks, who thanked reserve David Head for covering at 12 hours notice due to sickness.